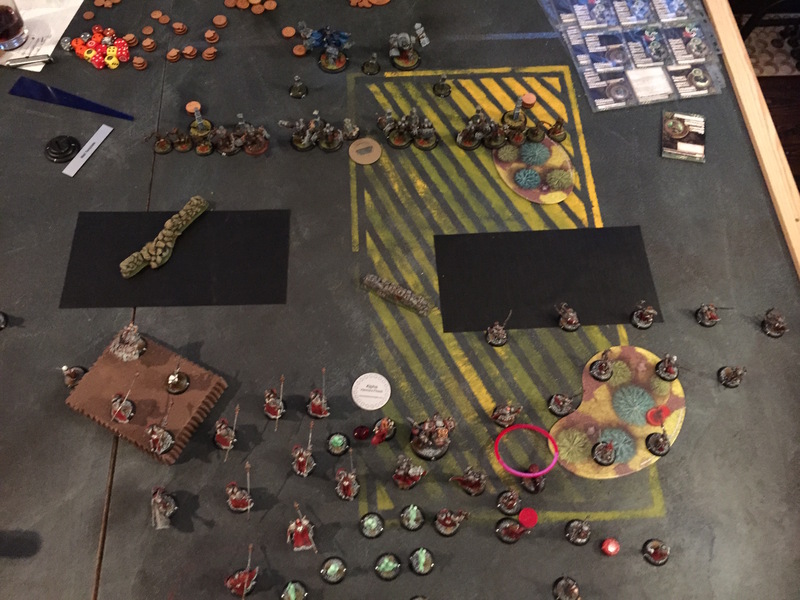 Then came Brad in its T4 incarnation with 8 Watchers and 1 Guardian – and led by a WTC player on top. Although I made serveral mistakes and should especially have IFed the BDP instead of Nyss at least during one round, I learned one thing in particular: I really felt pretty underpowered with S2! Amazing! Never felt this way with her. 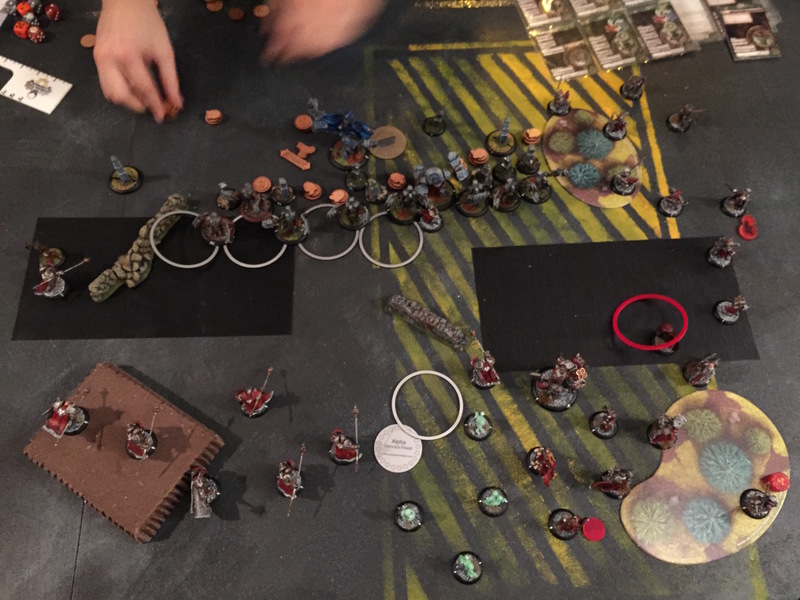 My plan for Sorscha was to flank Brad hard on both sides of the table, remove the assassination threat (aka Shifting Stones) first and go for attrition and scenario afterwards. 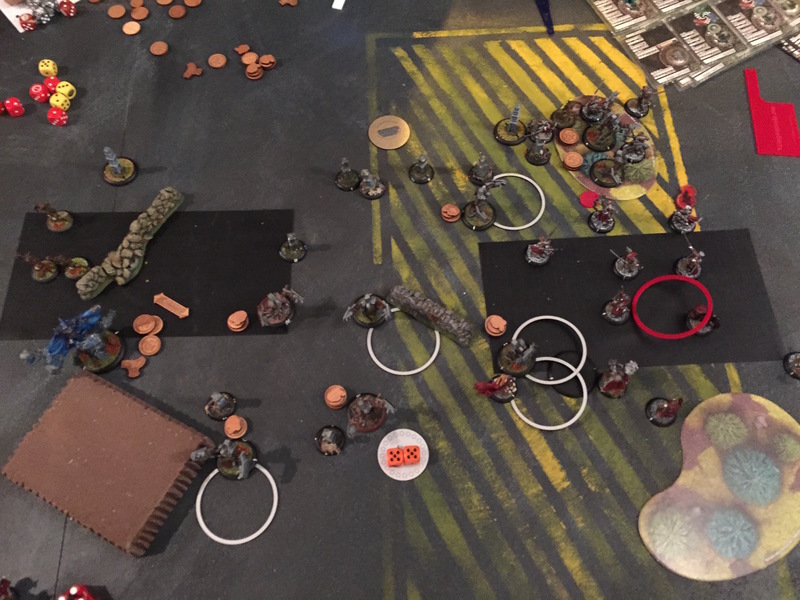 Ran everything up: Widowmakers and Yuri on the left flank, Nyss on the right. Sorscha IFed the Nyss. Advanced only moderately in the center. 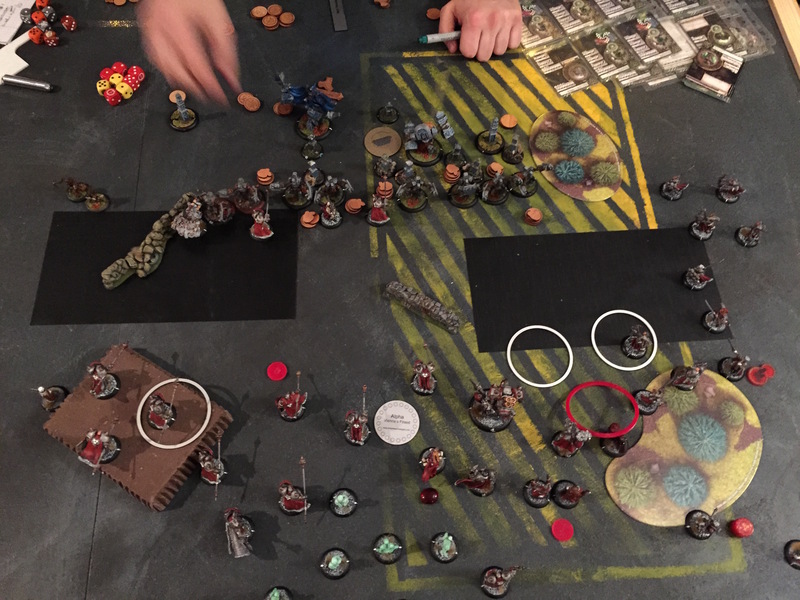 A Great Bear boxed a Pikeman to give Alexia a corpse. He spreaded his army wide and ran up with his stuff. Luckily a little too far with the Widowmakers and the Nyss. So I took the chance and went for some boosted fertilizer shots and on top got 2 Widowmaker with the Mannikins. Good start so far. The rest of my army just stoneformed into the middle. Oh boy, I didn’t expect to lose 2 Widowmakers to Mannikin sprays and another one (on the hill) to a Watcher shot. 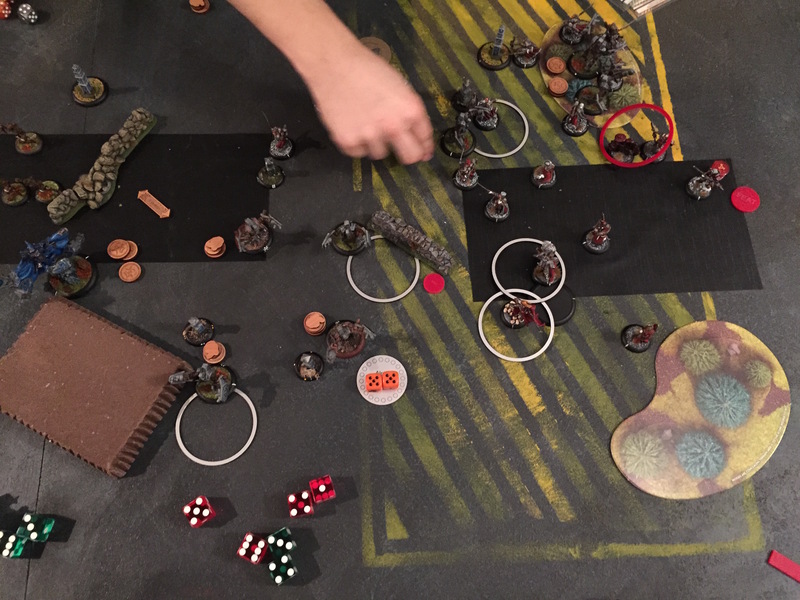 Even more amazing: losing two IFed Nyss to Watcher shots. 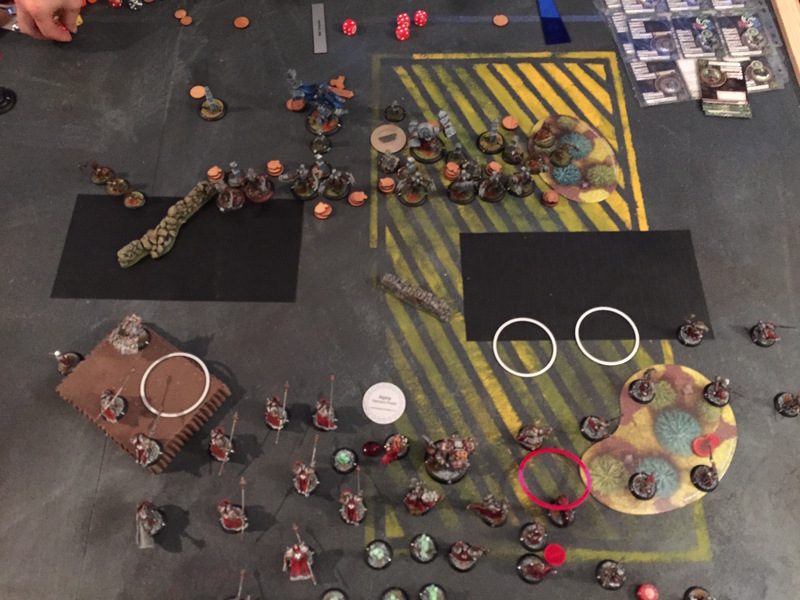 Anyway, upkeeped IF for free, moved up the Nyss on the right flank, shot Mannikins and combined at a stone (shield guarded). Used Zephyr to advance even more. Yuri charged one of the stones, threshered and did some damage to a Watcher. Core goal for him achieved. Way to expensive at this point, but: it works! Started shifting towards the right flank (GB, A&H, Alexia1, Berserker) and moved S2 to safety in the lower right corner (thankfully no Kill Box). 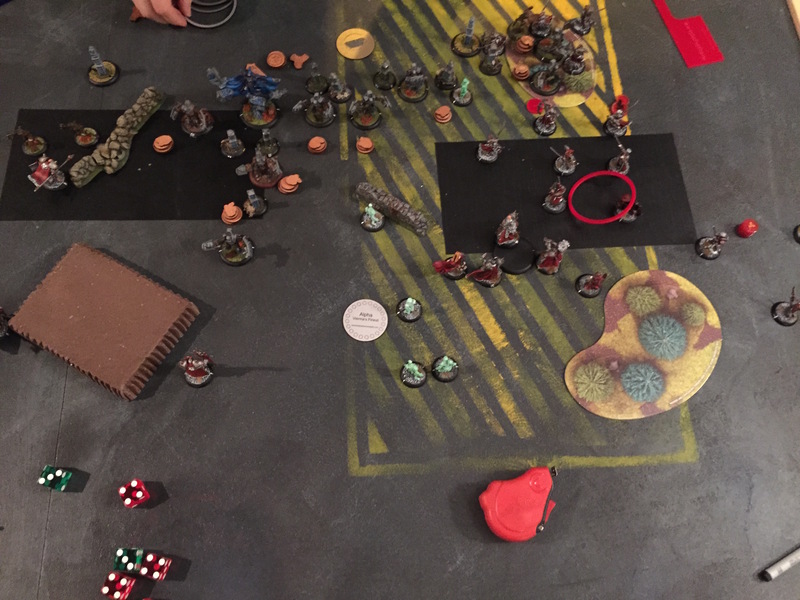 BDP mini feated and jammed a bit including a Thrall Warrior from round 1 – feared a feat-charge. I was expecting Sorscha to feat in the next round. So I tried to minimize the incoming damage. I killed the stuff that jammed me on my right flank and aimed on the left to get more of the Nyss. I didn’t feel comfortable with Brad in the zone. I lost too many Warlocks in an eSorscha feat turn. So hopefully he feats now, so I can easily sit back and score him to death. If only I had removed a 2nd stone last turn… I could have started dominating my zone at this point. #&%$§? Was really wondering why Brad didn’t start scoring this round? 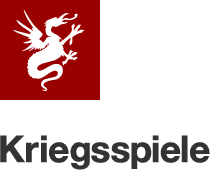 There wasn’t too much threat with Sorscha that far away. Even “light” jamming is really a bad idea: 4 forests and the new Risen and Thrall (we both noticed it this time) couldn’t get to a stone. Even worse: Those new Mannikins on the right flank didn’t allow the Nyss to charge the stones – what’s been their goal. I should have moved up Holt more aggressively. So, still no safety for Sorscha. Damm! I said you should feat now…. 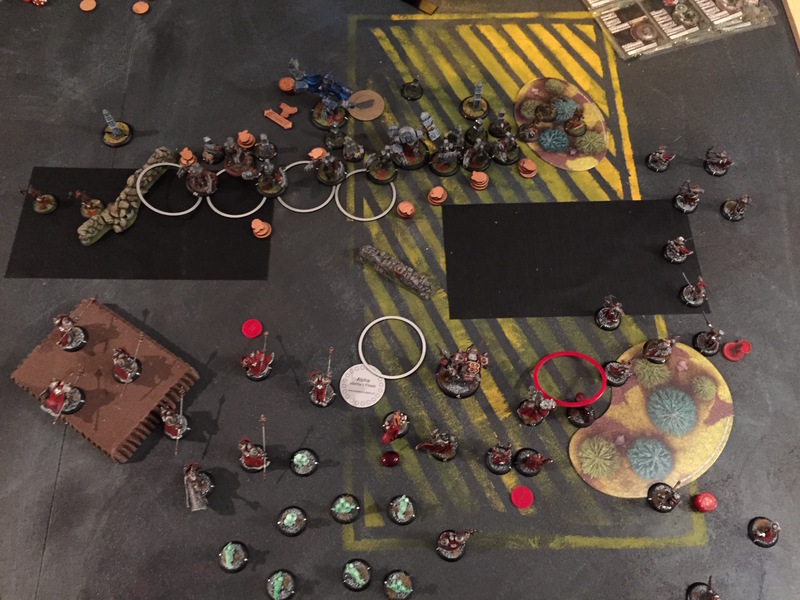 So I killed as much stuff on my right flank as possible, decided to trade the Guardian for his Berserker and failed on my left flank (left 2 watchers outside of Bradigus Control with no Shiftingstone in 1″). 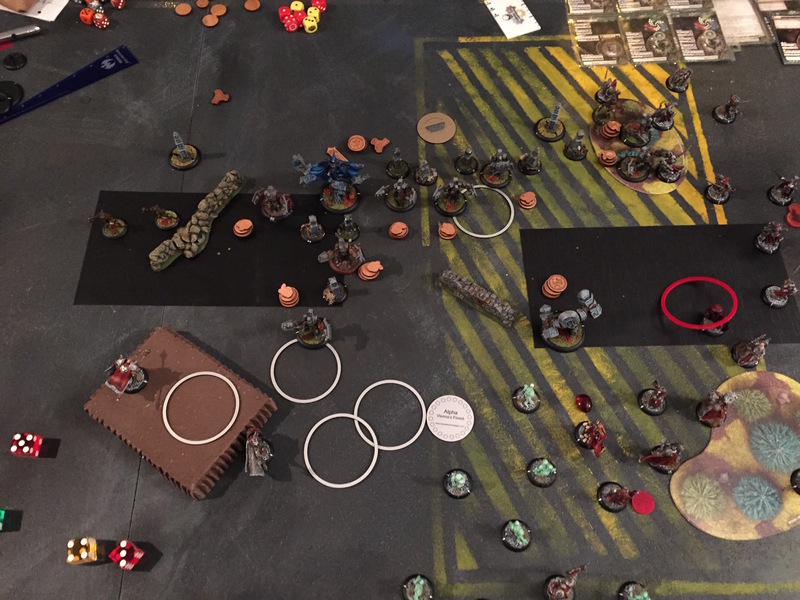 And the Guardian ate the Berserker, easily, … while the Watchers ate close to the rest of my Pikes: With DEF 13, ARM 14 they just died. IF would have been really important at this point, but even with the Khadoran arc node Sorscha was too far away. And for sure, Brad started scoring: 0:1 now. 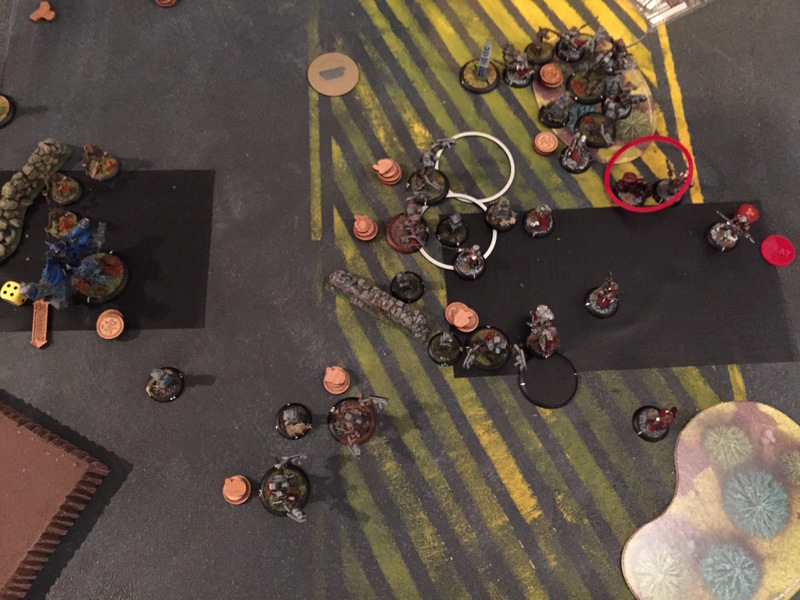 Anyway, the Great Bears and Alexia cleard my zone … and Sorscha had to take the risk for a 1:1. Brad should have been able to get to Sorscha, but why should he? 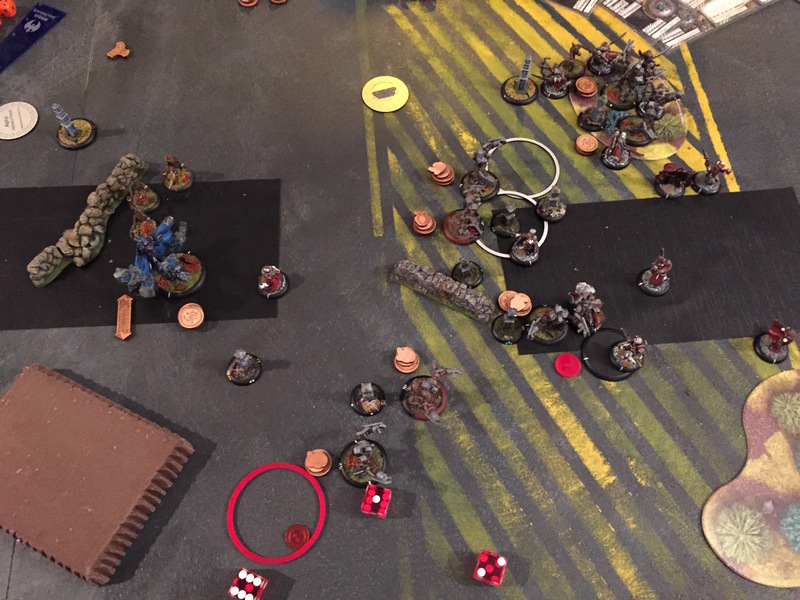 My left flank was a total mess now and I knew I couldn’t do much scenario wise anymore. My last hope was to keep Brad back because S2 still had her feat. Aiyana harmed one of the Wolds in the upper right forest … but the Nyss just didn’t get anywhere. They still didn’t even get a charge on one of the other stones. He scored, so 1:1 now. I took 3 minutes at the start of my turn to calculate the casterkill. 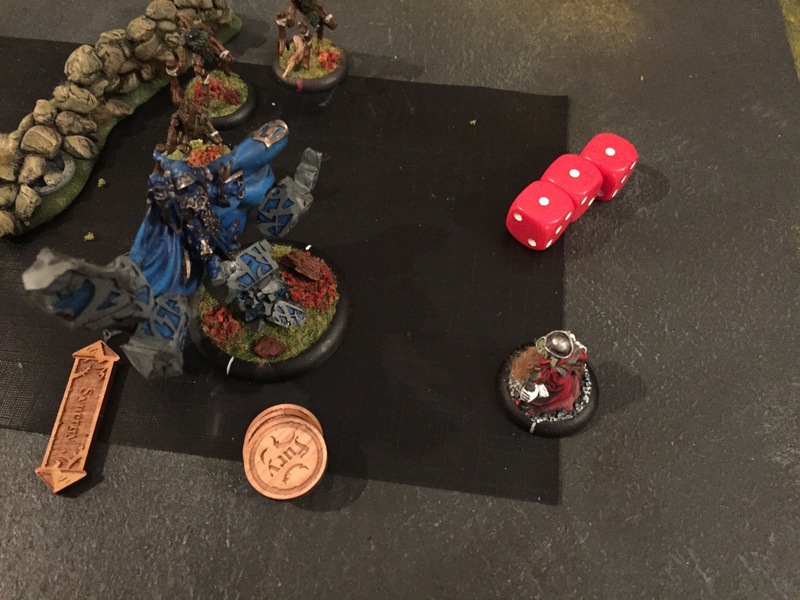 I could have a +4-5 Brad beating up Sorschas delightful body, but in the worst case I’m only hitting on sixes and have dice -4 for damage. With just one GB and Alexia without Risens I had to feat to remove the Watcher in the left corner of my zone. And Brad was too far away to go for him anyway. I finally managed to remove another stone. But well, Brad couldn’t get to Sorscha at this point. At least the Watchers couldn’t either. 2:2 on scenario now. Now you waited to long for your feat! I killed the Objective and scored another point in the zone: 4:2 now. And game over. 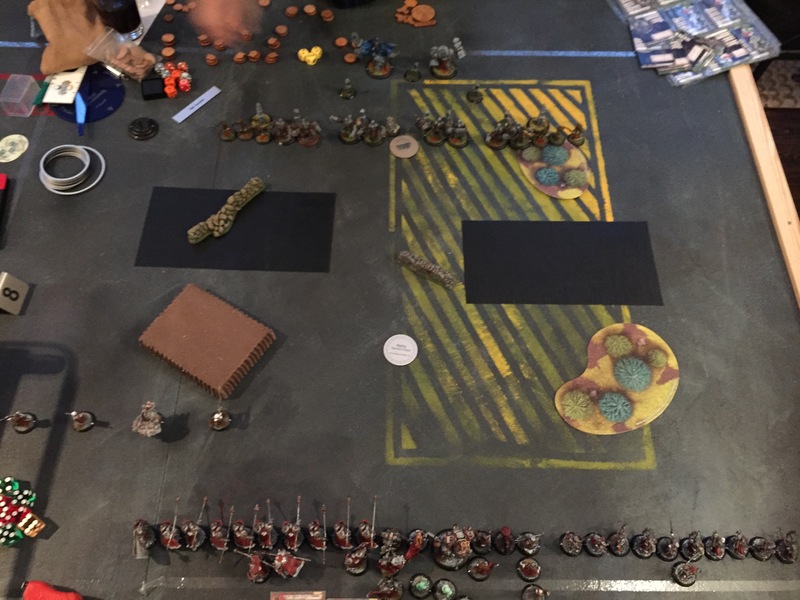 He has to ran everything into my zone but he could only reach the zone with the Gobber. Well, game over. At 2:4 and no options left, I just tried everything to clear the zone again. More for doing something at all. And I ran the lovely SPD 7 Gobber (yes, really, short legs but fast ;) into the other zone to contest. IF is a thing against Bradigus and I should probably have deployed the Nyss on my left flank to contest Brad’s zone and move everything else towards the right flank. Even “light” jamming is not helpful: It mostly helps Brad building Synergy and will result in lots of new forests on top. DMG output is crucial against Brad: I’m not sure if Sorscha2(‘s feat) is enough, even when running GB and BDP. Both Irusks and Butcher1 should have an easier game attrition-wise.